I created this image and slogan to capture my feelings after Blockupy. I have taken the background photo out of a live stream by the public/state-owned TV station Hessischer Rundfunk (hr). 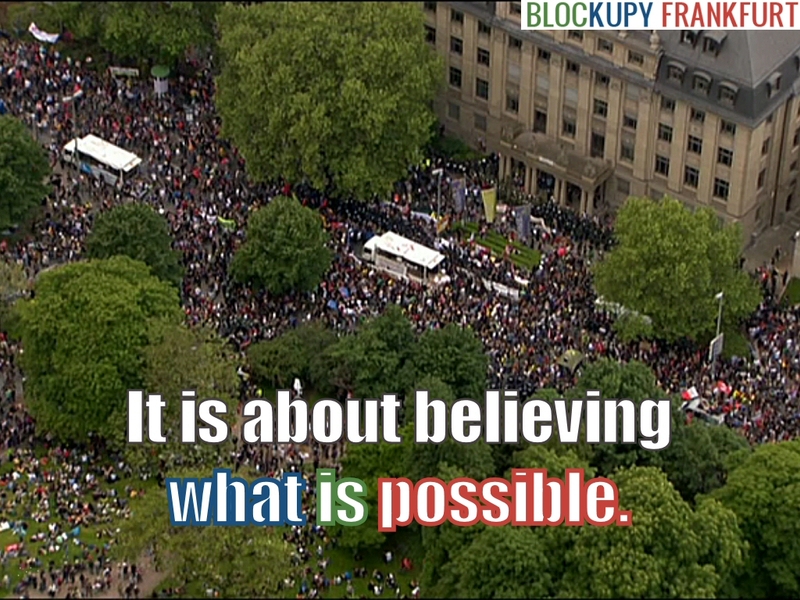 It shows the rally/assembly near the European Central Bank in Frankfurt on Saturday, the last day of Blockupy. Share it freely. After four days of Blockupy Frankfurt and peaceful protest by more than 20,000 humans (according to the police), there is an awesome feeling in the air. It is possible to show worldwide solidarity. It is possible to come together in great numbers. It is possible to protest for real democracy, against austerity policies, against the overwhelming power of financial institutions. It is possible to take squares temporarily and symbolically block the banking sector. It is possible to stay completely peaceful and upbeat! A lot of people do not participate in democracy or social movements because they believe change is not possible. And of course, as long as they are not taking part, this is true. This is probably the most important obstacle to trying to improve the world. Once you know change is possible, it is within reach. It is about believing what is possible. And Blockupy, as many like-minded events and movements worldwide, again will convince, with good reason, a rising number of people that there is courage and hope! Blockupy goes on! Occupy everywhere! This work by TheCitizen.de is licensed under a Creative Commons Attribution 3.0 Unported License. ← No-go area Frankfurt. Blockupy as hope.